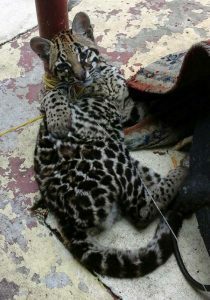 This baby ocelot, also known as the dwarf leopard, has been on sale for the past week. It is clear that the seller is unaware of the protection offered to these endangered species under the laws. The photos are being circulated, worrying and angering conservationists. All wildcats are protected by law in Guyana. It is illegal to capture or sell them. Wildcats provide an essential role in the natural environment and in keeping the food chain balanced. When humans encroach on their habitat and further compound this by entrapping and selling them it decimates their population even further. Wildlife and wildcats have heavily been promoted as an essential part of the country’s tourism industry. The price for this one was originally $100,000 but this has been reduced to $50,000. The matter has been reported to the Environmental Protection Agency.